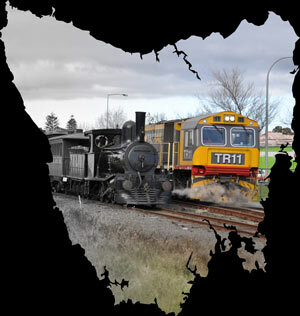 While the Australian Railway Historical Society (Tasmanian Division) makes every attempt to ensure the accuracy and reliability of information published on, served by and accessed via its Internet pages, the information contained therein should not be relied upon as a substitute for formal advice from the appropriate bodies, nor will the Society be responsible for any loss, however arising, from the use of, or reliance on this information. Users should also note that the ARHS Tasmania does not endorse as to accuracy or content, links on their Web pages to external Internet sites not published or maintained by it. All material published on the Internet by the Australian Railway Historical Society (Tasmanian Division), is protected by the provisions of Copyright Act 1968 (Cth). Other than in accordance with the provisions of that Act, or as otherwise expressly provided, a person must not reproduce, store in a retrieval system, or transmit (in any form or by any means) any such material without first obtaining the written permission of the Society or Author (as may be appropriate) to do so.